Nioh is sprawling, punishingly difficult ... and fantastically rewarding. 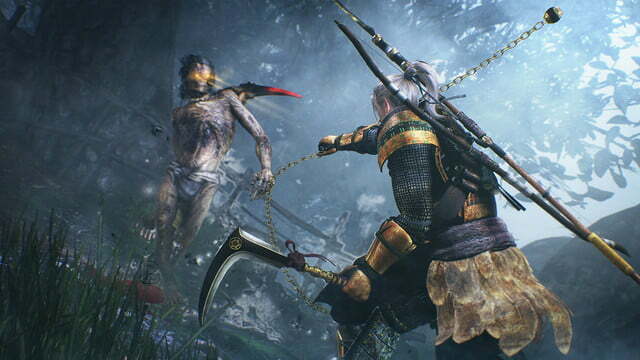 By this point, you should already know this to be true: Nioh, an action game from Ninja Gaiden and Dead or Alive developer Team Ninja made in the style of From Software’s “Souls” and Bloodborne games, won’t let you get very far if you aren’t careful. Between the core Souls series, 2014’s Lords of the Fallen, and now Nioh, it seems the masochistic “Soulslike” has been elevated to a full-on sub-genre. Its hallmark, as far as most players are concerned, is its difficulty. Nioh is made to be punishing. The frog, lying in a pool of its own blood, says rushing through will get you killed. Lots of things will, in fact, get the better of you. And much like its forebears, Nioh requires you to take your time, carefully manage resources, and plan your actions meticulously to succeed. 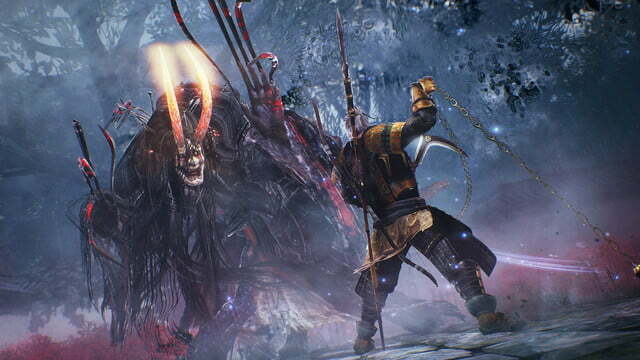 Nioh’s combat system makes Dark Souls’ seem simple in comparison. But there’s more to the SoulsLike than raw difficulty. There’s an oppressing atmosphere — the foreboding sense that death might lurk around any corner, which sets a delicate pace and keeps you on your toes. There are labyrinthine levels that fold in on themselves, testing how far you can stretch your limited healing items. There are an unholy number of different weapons, each of which has its own control scheme and quirks to master. And there are the blessed safe resting points — in Souls, bonfires; in Nioh, shrines. Nioh has these elements, but remixes and subverts the Souls games’ burgeoning “tropes” in ways that make it much more than a simple piggy-backer. That doesn’t mean it’s any friendlier to new players. If you’re not already a Souls veteran, you’re going to have a hard time getting into it. But while that may make it a tough sell for newcomers, it’s very much a part of the charm for fans. Nioh follows Sir William Adams, an English pirate who escapes from the Tower of London and chases necromancer Edward Kelley halfway across the world to Japan. Kelley has stolen Adams’ guardian spirit, Saoirse, and Adams is determined to get her back. But as Kelley begins meddling in Japan’s devastating civil war, a conflict between the warlords Akechi Mitsuhide and Tokugawa Ieyasu, William is forced to choose a side and influence events with global ramifications. 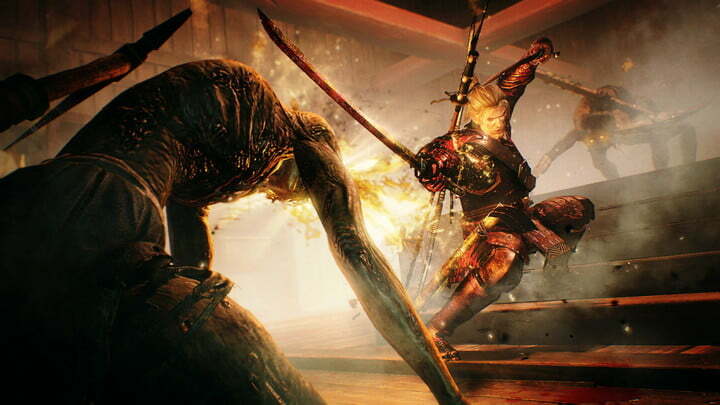 While the main quirk of all this is that while Nioh’s Japan is infested with “yokai,” demonic spirits and monsters, its major characters, including Sir William, Kelley, Mitsuhide, and Ieyasu, are based on historical people and institutions. No, they probably didn’t really have spirit animal guardians granting them magical powers, as they do in Nioh, but in many other ways the game goes to great lengths to anchor aspects of the story with historical accuracy, including through some cool, stylized cutscenes. Granted, the story is basically impossible to wrap your head around for the game’s initial hours, and not in the fun way that From Software’s games like to obscure important details. Nioh simply throws so many names, places, and events at you that you’d need a degree in Japanese history to understand any of it. It becomes more focused and fun to follow in the game’s second half, assuming you can hang with that early onslaught. Some of that confusion likely stems from the game’s complicated and kind of incredible development history. Nioh began its life 13 years ago as a PS3 role-playing game with transmedia story elements based off an unfinished script by Akira Kurosawa, the famed Japanese filmmaker. Throughout development the game was handed off, re-written, and redesigned from the ground up multiple times, until it eventually became what we have now. Given all that, it’s amazing that Nioh turned out as great as it is. Nioh is structured around multiple region maps that let you select among numerous side and main missions. Unlike other SoulsLike games, there is no unified, hive-like world map. Instead, each mission takes place in its own complex, twisting environment, with hidden traps, sneaking enemies, secrets to find, doors to unlock, and bosses to get crushed by. Sprawling and dense as these levels are, it’s a little too easy to get lost, and even a cursory map would have been extremely helpful. It may have gone against the spirit of the SoulsLike, but it would have ensured we wasted less time. Side missions sometimes re-use the levels from story quests, but, even so, there’s a lot of variety among the missions; A maze-like estate filled with skulking ninjas might give way to a compact onsen — a Japanese bath house — where demon yokai go to relax, or a sprawling, corpse-strewn battlefield, or a besieged castle whose beleaguered defenders are so filthy and starved they thank you for killing them. 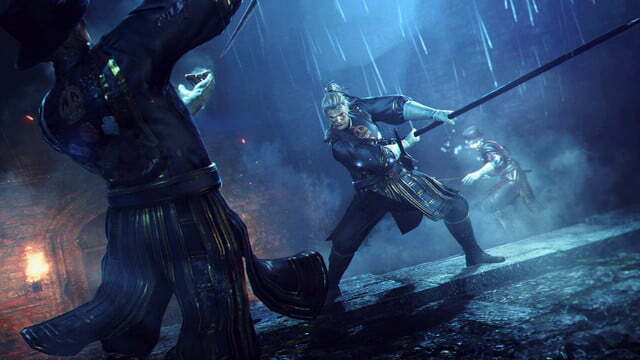 As an action RPG in the Souls tradition, Nioh lives and dies by its combat. 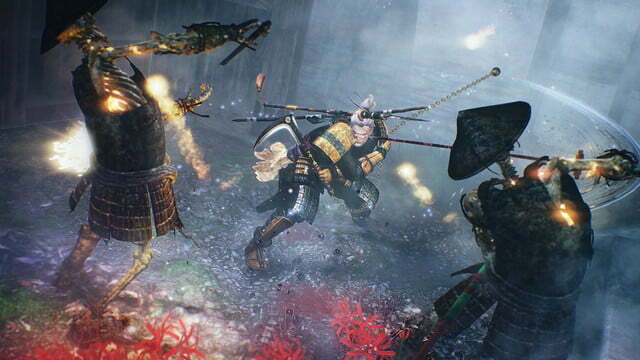 And like the games that inspired it, Nioh is methodical, requiring precision and forethought with every swing or swipe. Thankfully, Nioh also builds considerably on the standards set by From Software, and does so in ways only the developer of Ninja Gaiden could. Nioh’s combat becomes more of a dance than other Soulslikes. 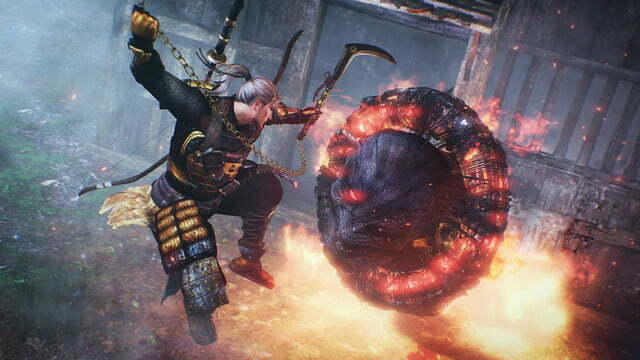 Nioh has no shields, and blocking takes up huge chunks of stamina, so you’ll wind up using it sparingly as you instead dodge around and fire off unique weapon skills unlocked through the game’s many skill trees. Many of those skills improve the flow of battle by incentivizing you to chain together stance shifts, ki pulses, and weapon changes. One spell, the “sloth talisman,” is so effective at slowing enemies down — including bosses — it’s practically required for some of the game’s harder fights. The most notable individual change is the addition of stances. 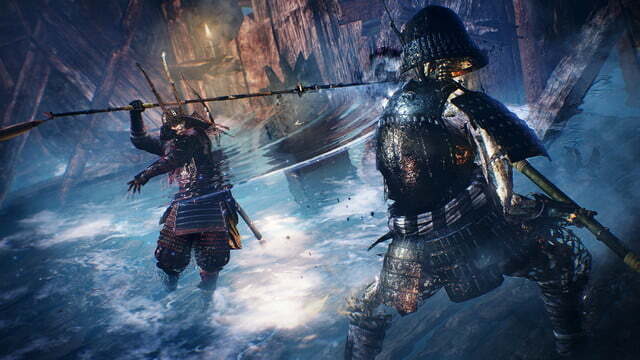 There are still light and heavy attacks, and multiple weapon archetypes with their own unique moves, but Nioh also allows you to switch between low, middle and high stances, which drastically affect how your weapons perform. Each stance changes your weapon’s reach and move set, and switching between them rapidly makes your stamina regenerate faster, allowing you to get more attacks in before you’re forced to rest. Team Ninja has also taken something from Gears of War’s famed “active reload” system in the way stamina regenerates. If you tap R1 at the right time, you’ll activate a “ki pulse,” which allows you to regenerate your stamina much more quickly, so you can fire off more attacks and stave off a dreaded penalty that renders you motionless should you let your stamina bar run out during combat. That “ki pulse” system instills even more risk/reward in Nioh’s combat: The penalties for continuously attacking without letting your stamina recharge are considerable. If you miss your cue in the heart of battle, which is easy to do when you’re surrounded by huge demons, you’ll be in for a rough time unless you can limp away to recover. Filled with skulking ninjas or a Japanese bath house where demon yokai go to relax. If all that sounds complicated, well, it is. Nioh’s combat system makes Dark Souls’ strong/light/one/two-handed attacks seem simple in comparison. And that is, unfortunately, reflected in the game’s overcomplicated and rather poor control scheme. Using the default control scheme, you attack with the face buttons (square, triangle, etc. ), which means you can’t manipulate the camera while attacking; all items are consigned to the d-pad, so you can’t heal your health while moving; and several buttons change function when you’re holding other buttons, making everything generally hard to keep track of. There are multiple control schemes, but they all have the same problems, and there’s no way to simply re-map buttons where you want them. The silver lining is you’ll get really good at clawing one hand across the controller to pop health elixirs while running for your life. 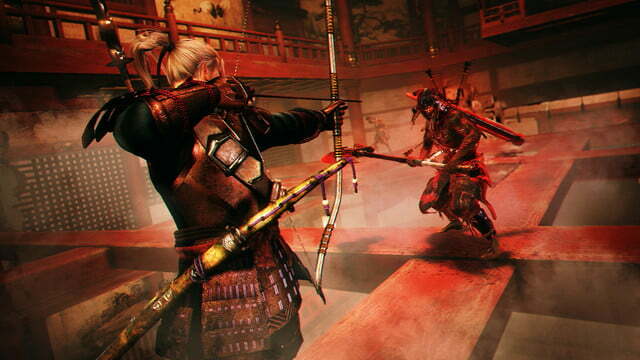 Still, with time you can master Nioh’s systems, which allow for an impressive and elegant fighting style. You’ll use combos as springboards for devastating special attacks, shifting stances with every ki pulse to maximize your stamina, and enjoy a huge variety of extra ninjutsu and magic items to buff yourself and mess with enemies. 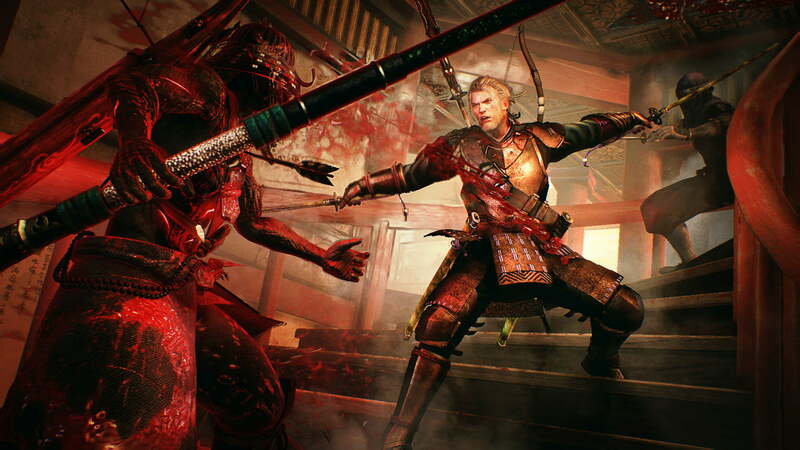 Nioh takes a lot more from its predecessors, including the way online play works. You can see spots where other players died as “bloody graves” that also tell you how they died and let you challenge their AI-controlled doppelganger to a duel. You can also summon friends or random players into your game, or hop into others’ games, to help in the spirit of jolly cooperation. Co-op is limited to two players at a time (the host and one summon), but what’s there works surprisingly well (in the game’s pre-release environment, at least). 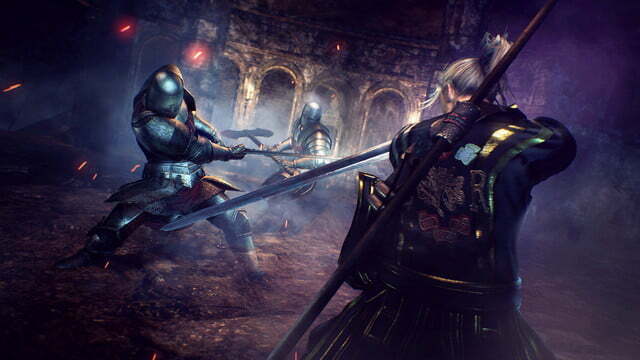 Compared to both Bloodborne and Dark Souls 3, which had bare-bones online infrastructure, Nioh makes it comparatively easy to play with your friends. It’s a huge upgrade. While the game does not feature any sort of PvP “invasion,” another Souls staple, Team Ninja said it plans to add that feature in a free post-launch update. Dark Souls isn’t the game’s only inspiration, though. 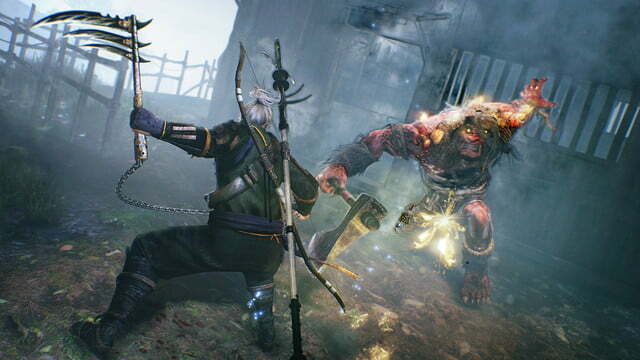 Nioh’s loot system more closely resembles Blizzard’s Diablo. Nioh downright showers you with loot, frequently dropping two or three items, plus gold, per kill. You’re always getting new and better gear, but it also translates into several minutes of inventory management after (and sometimes during) every single mission. Despite the “familiarity” system that’s meant to encourage you to use the same weapons for extended periods, you shouldn’t get too attached, because you’ll probably get something better in the next quest. The “soul matching” system, which lets you feed bits of gear into each other like Destiny’s infusion feature, should have alleviated the problem, but once you get to a high enough level, the cost becomes prohibitively expensive; If you buy nothing else the whole game, the gold you’ll earn in 40 plus hours won’t be enough for a single high level soul match. Nioh is a great pick for veterans of the “Souls” series and games like it, but isn’t a great jumping off point for players who aren’t familiar with this type of game. If you haven’t already, we’d recommend playing Bloodborne and Dark Souls 3 first. Once you’ve conquered those, move on to Nioh. You’ll be thankful there’s more of this genre to enjoy. 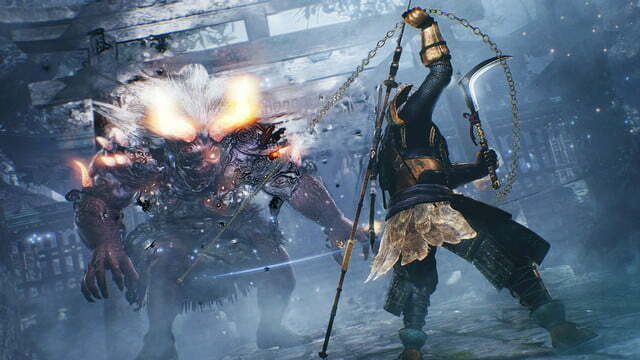 Nioh can last anywhere from 40 to 80 hours for a single play-through, with plenty of side missions, co-op multiplayer, and other random stuff to do. Yes. 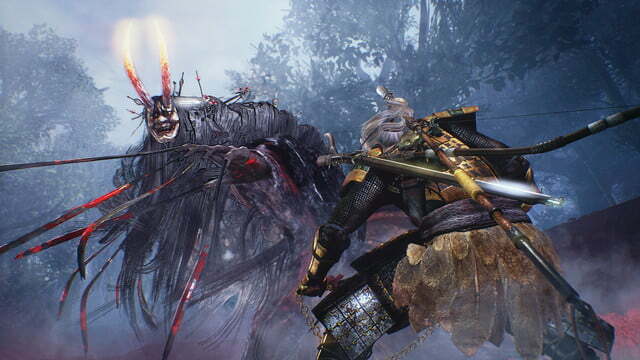 There’s no “Dark Souls 4” or “Bloodborne 2” from From Software on the horizon, but Nioh is a great way for veteran “Soulslike” players to get to get another fix.